How many pelicans are there in New Zealand? In a normal year, the answer to this question would be ‘one’ – namely Lanky*, Wellington Zoo’s oldest resident. 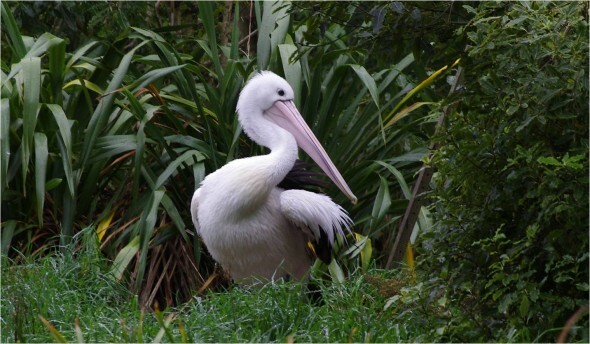 Lanky is an Australian pelican, and is the only captive pelican in New Zealand. He has been at the zoo since 1978, and is reported to be 37 years old. But the last year has not been a normal year for vagrant birds in New Zealand. *Lanky was euthanised in April 2016. Heavy rainfall in eastern Australia in 2010 & 2011 created headlines with extensive flooding, property damage, and loss of lives. However, the catastrophic floods created ideal breeding conditions for many waterbird species, as inland lakes filled with water following decades of drought. As the water receded the burgeoning flocks dispersed – and some birds made it across the Tasman Sea. Plumed whistling ducks, gull-billed terns and Australian pelicans all reached New Zealand in record numbers in 2011 & 2012. With the notable exception of a certain emperor penguin, vagrant birds rarely make the news in New Zealand. But a flock of 14 pelicans on the Kaipara Harbour was considered newsworthy enough to be reported on Campbell Live on 24 August 2012. The flock had first been seen on 6 August, followed a day later by a single bird at Kerikeri Inlet, Bay of Islands. 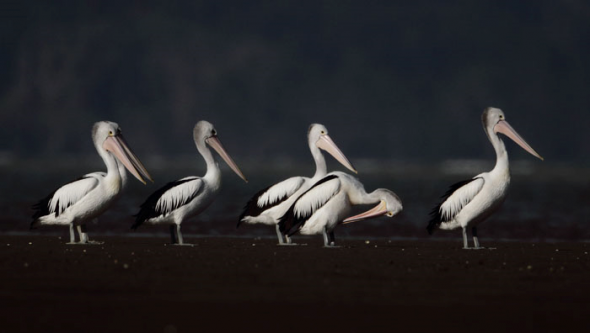 The arrival of so many pelicans in New Zealand was unprecedented. There had been only four previous records since 1890, each of 1-3 birds. Ironically, the most recent record was in 1978 – the year that Lanky arrived at Wellington Zoo. During the 12 months following the pelicans’ arrival, small flocks and lone individuals had been seen on rivers and harbours throughout the northern North Island, from Parengarenga Harbour south to the Waikato River. 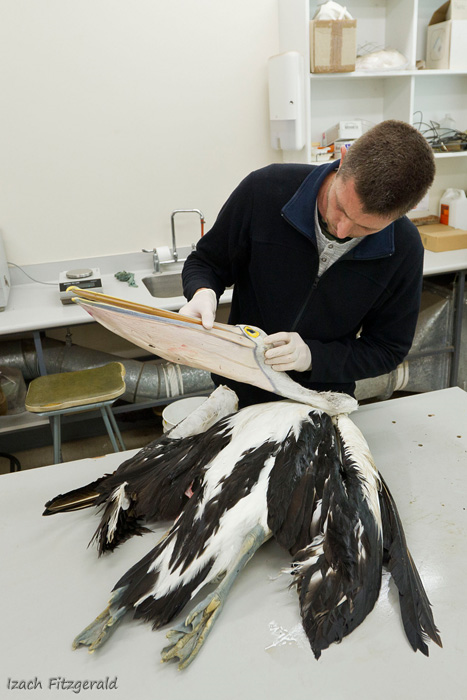 The maximum count reported was 18 birds together near Tapora on the Kaipara Harbour in April 2013. Birdwatchers were delighted to have an exotic new species to add to their New Zealand list, but were dismayed to hear that others were not as appreciative. First came reports that up to four pelicans had been shot on the Wairoa River south of Dargaville (just before the maximum count was reported). Then one was found freshly shot near Meremere on the Waikato River on 21 May 2013. Fortunately some birds survived, and up to ten pelicans continued to be reported from the Wairoa River. Were these the only birds, with the flock occasionally dispersing and reforming? Or were there several flocks scattered throughout Northland? One way to answer this was to conduct an aerial survey of their known and likely haunts. Pelicans are ideal candidates for an aerial survey – they are large, conspicuously patterned in black-and-white, and live in open habitat on large water bodies. After departing from Kerikeri, we confirmed our search image by heading straight for the pelican hot-spot – the Wairoa River between Dargaville and Ruawai. We picked up the river upstream of the town, but did not see any pelicans until halfway to Ruawai. As expected, they were easy to identify from our survey height of 500 ft (170 m), whether in flight or sitting on the water. From the Wairoa River we continued as far south as Kellys Bay, then looped round to Tapora before completing our survey of the northern Kaipara Harbour. We had already checked Mangawhai Harbour three days earlier, so continued north over Whangarei Harbour, Bay of Islands, Whangaroa Harbour, Mangonui Harbour, Rangaunu Harbour, Houhora Harbour and Parengarenga Harbour. Pelicans had been reported from many of these sites, including 8 at Parengarenga in May 2013, and 4 over Rangaunu in June. But despite careful searching, the only pelicans we found were ten birds on the Wairoa River, spread over 10 km, including one group of four birds. The Cessna proved to be an excellent platform for surveying waterbirds, including a flock of five suspected gull-billed terns near Matakohe on the Kaipara Harbour, and impressive flocks of royal spoonbills on Rangaunu and Parengarenga Harbours (a combined estimate of 550 birds, with smaller numbers on six other harbours). I read in a book called A Penguin History Of NZ by Michael King that there were pelicans in NZ when Maori discovered NZ. But within 100 yrs they were wiped out along with all the large flightless bird species. Gill, B.J. ; Tennyson, A.J.D. 2002. New fossil records of pelicans (Aves: Pelecanidae) from New Zealand. Tuhinga 13: 39-44. Scofield, R.P. ; Worthy, T.H. ; Schlumpf, H. 2003. What birds were New Zealand’s first people eating? – Wairau Bar’s avian remains re-examined. Records of the Canterbury Museum 17: 17-35. Worthy, T.H. 1998. A remarkable fossil and archaeological avifauna from Marfells Beach, Lake Grassmere, South Island, New Zealand. Records of the Canterbury Museum 12: 79-176. Thanks for your comments Wendy. I am unaware of any suggestion that the birds be captured for tagging or tracking. A group of 4 have been reportedly seen on the Whanganui and Patea Rivers Dec. 2013 according to the Wanganui Chronicle. Whilst working on a garden on a hillside above Mangonui Harbour yesterday I spied 6 large birds circling overhead. 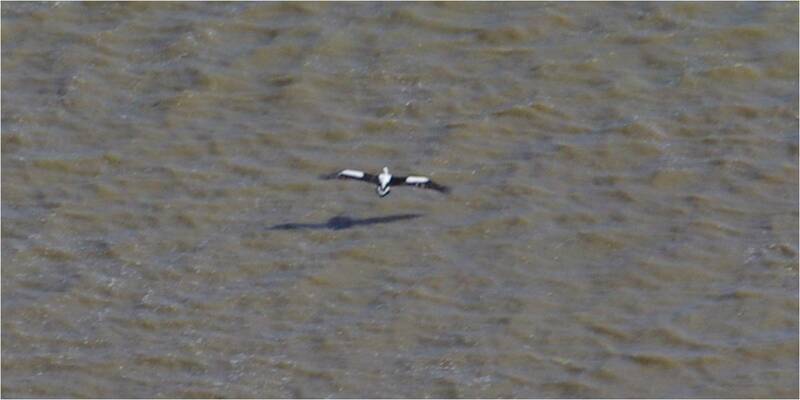 They were gliding on the warm air and had beautiful black and white wind plumage with separated tips. They were pelicans!! Three of us had the joy of watching them for 5 minutes before they glided off . Rang Far north ornithological society and discovered your story above. Hope they stick around!! Interesting article and so great to see someone is keeping an eye on them …. I find pelicans so beautiful to look at, would love to see some in the wild to photograph. Haven’t seen any in Southland yet though, will keep my eye open in my travels. What an interesting article, I’ll keep an eye out in Lower Hutt, rivers and estuaries, you never know.